The best recliners for sleeping are designed to provide a more comfortable resting position. Moreover, in most of them, the back and footrest are adjustable. The capacities and features vary across the board depending on the level of technology used. We’ll discuss recliner technology towards the end. We’ll also discuss why sleeping in a recliner has been proven to have more advantages and obviously get to review the best models in the market today. Let’s take a look at the best recliners for sleeping on the market today. La-Z-Boy launched their first recliner in 1928 with the company basing its foundation on comfort, innovation, and professional craftsmanship. Their remarkable efforts over the years have led to the superb designs we see today and particularly in their La-Z-Boy PowerReclinerXR. The Recliner is designed with the specific intention of creating soothing sensation and enhanced relaxing capabilities drawn from the motion of the in-built rocker. La-Z-Boy Inc. is an American based furniture manufacture with their headquarters in Monroe, Michigan. They mostly deal in home furniture employing over 11,000 people all over the country, the UK, Canada, Australia, Germany and many other countries as well. It’s made with upholstered fabric highlighted by a well-smoothened wood finish on the handle and rocker base. The recliner has an opulent seat and leg rest with soft padding on the arms. Dimensions are 41 x 39.5 x 41 and an average weight of 80 lbs. Tapered, channel-stitched back to enhance full body support. 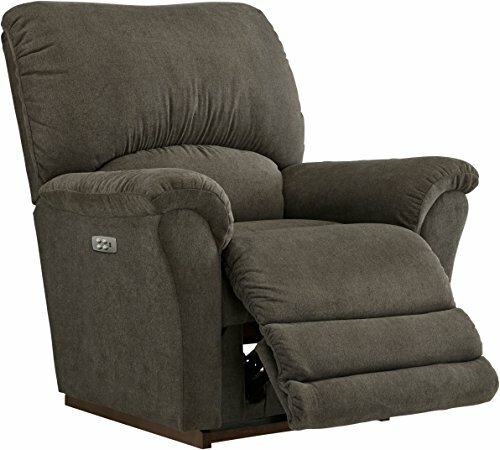 Adjustable, 3-position and lockable leg rest, incredible recliner flexibility, and convenient handle placement. Intensively detailed and illustrated user manual with safety precautions and simple to understand maintenance procedures. Limited lifetime warranty covers different recliner mechanisms and parts. An effective rocking mechanism that significantly boosts relaxation. Made using mostly wood and is therefore very environment-friendly and durable. Detailed and easily understood assembly instructions on the user manual. Built in USD charger – great for charging smartphones, tablets, etc. Tested and proven comfort and relaxation features. Lightweight with removable backs to allow for easier portability. The stylish design and appealing sand color blend perfectly with living room décor. Approved by the American Chiropractic Association (ACA) for soothing back pain. Accommodates a weight of up to 300 pounds. Delicate leg rest can easily get damaged if mishandled or overused. Changing from reclined to upright position can be complicated, but this is common to most rocking recliners. May take some effort to raise the leg rest after some period. The La-Z-Boy Calvin PowerReclinerXR is no doubt smaller than most recliners for sleeping. It can be used in small spaces as well as in large rooms due to the additional décor compliment it provides. The chair itself is ideal for sleeping as well as therapeutic for back pain due to the lumbar support. We think that if you are looking for the best recliner for sleeping, this La-Z-Boy is one of your best options. 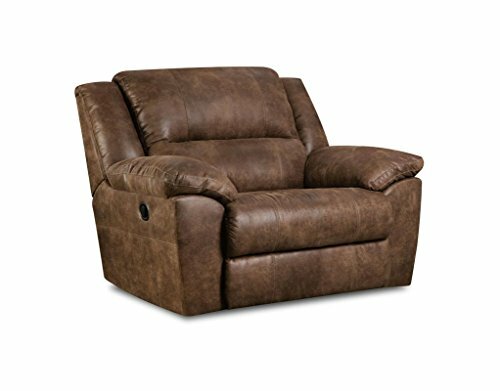 The Zavier Oversized Power Recliner is a high-end, leather reclining couch designed by Ashley Furniture for comfort and relaxation. The recliner is intentionally crafted to be massive for increased support by accommodating the entire body of the person sitting or even two. Ashley furniture industries is a US-based furniture manufacturer and seller whose headquarters is in Arcadia, Wisconsin. Founded in 1945, the company has dramatically improved the quality of their products over the years as their production techniques have increased. Ashely Furniture are known for their couches, sofas, and other living furniture, but they also produce other household products as well. The recliner has an overall weight of 128 lbs., with dimensions of 81”W x 41” D x 42” H. It has 21” of seat height and an extra 70” reclining length. It’s made of 95% Polyester and 5% Polyurethane. Polyester highly resists staining and color fading, and it also enhances the durability of the couch. The couch comes with cushion cores designed using high-density foam and comfort padding to boost relaxation. Faux leather & truffle upholstery increases softness and boosts the decoration and beauty. It has tractable seat positions by using a single touch power controller. The seat and frame are reinforced with metal thereby enhancing durability. The product comes preassembled with simple instructions for re-assembly. Finally, it’s constructed using environmentally-friendly materials. Highly durable due to the efficient design and materials used. Enjoys easy and flexible recliner control. Crafted with appealing leather material enhancing décor. Plush, cushioned seats for greater comfort while sitting and sleeping. Straightforward reassembly with carefully written instructions. Its large size and space enhance full-body support, and the single-seater can accommodate up to 2 people. Its bulky nature and weight limits portability. The metal parts can be uncomfortable or dangerous after some time if the assembly is not done well. 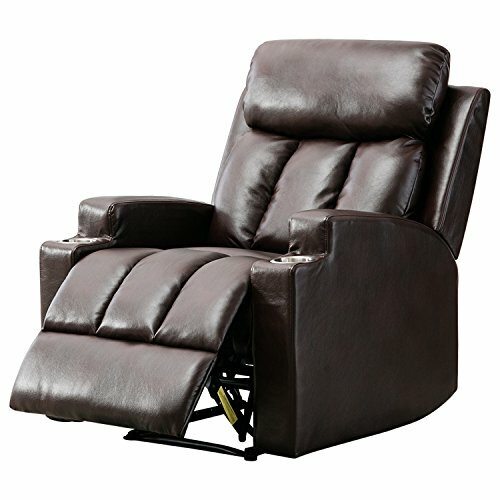 The Zavier Oversized Power Recliner offers a unique, luxurious experience with durability that beats most of its closest rivals. The design and spaciousness provide a remarkable relaxation which is perfect for those looking for a good nap or have nagging back pain. Moreover, the user-friendly recliner control allows people of any ages to use it, unlike most other recliners that remain challenging to operate. The quality construction, decorative, and spacious design makes the average retail price a grand bargain. Therefore, if you want a couch that will add to the beauty of your living room and a spot to drop all your fatigue from a long day of toiling, then the Zavier is a good choice. The BONZY Oversized Recliner Chair is a large super cozy reclining chair applicable for lounge or living room. Designed specifically as a wall hugger, the Bonzy Chair can be pressed against the wall to take up less space. Bonzy Ltd is a trademark owned by Zoy Home Furnishing Co., Ltd. Bonzy was formed in 2003, and it’s based in Tangpu Industrial Park, China with its market spreading over USA, UAE, UK, Japan, Australia, and other countries. BONYZY Home Furnishings mostly focus their production on comfy furniture and motion sofas. Made of high-end, rich, bonded, luxe leather gel upholstery with a breathable backing that allows for temperature control and extra comfort. The frame is constructed using Laminated Veneer Lumber (LVL) which enhances stability and seat strength. A metal reinforced seat and footrest for extended durability. Simple disassembly and reassembly. These greatly improve the chair’s portability. Overall dimensions of 42 x 38.5 x 39.4” (W x D x H) and a seat size of 22 x 21.5 x 19. Weight capacity of 300 lbs. It supports a maximum bearing weight of 330 lbs. Built using low-emitting materials that surpass compliance standards. An easily adjustable recliner control using a simple lever. Resting design position and padded arm and back cushions to provide instant relaxation. High comfortable due to effective padding, pillow-top cushions, and supple curves. Long durability and sturdiness. Tested 25000 times to ensure mechanical strength. Stylish design particularly on the rivets and comes in Gray/brown colors. Perfect nail head trimming and tufting prevent minor injuries. Guaranteed warranty from the manufacturer. More portable than most recliners. Simple to use recliner control. Its soft touch allows easy cleaning and maintenance. It has an unbalanced center of gravity hence moving it may require two or more people when assembled. Can only accommodate one adult, and excess weight may cause structural damage. The spacious, heavily padded and eye-catching design of the BONZY Oversized Recliner Chair is definitely worth its asking price. The sturdiness and long durability will ensure the comfort and flexibility outlasts its rivals. If you want a couch that will endure you sleeping for long periods of time like when you’re exhausted, binge-watching an addictive TV show, or when you just want to relax outside as you enjoy the scenery, then this is the chair for you. The COLIBROX Electric Lift Chair Recliner is among the new gen types of reclining chairs run using electric power to recline in some positions. This particular chair is specifically designed to aid elderly persons by adjusting the posture to favor comfortable sitting and sleeping as well as easy standing. The overall comfort, however, is not in any way diminished by this particular attribute, which is why it is a fantastic choice for anyone who is looking for a recliner that they can sleep in. The COLIBROX Electric Lift Chair Recliner is made of super-quality, soft, and odorless fabric stuffed with a high-density sponge for extra puffiness and hence greater comfort. It has a Whisper Quiet lift and adjustable recline mechanism controlled using a simple Two-button handheld remote-control device. Product dimensions of 31 x 36 x 40.5” (W x D x H) and a net weight of 91 pounds. The chair accommodates an outstanding weight capacity of up to 220 pounds when lifted and 330 pounds when not lifted. An adjustable footrest coupled with nicely padded arms and a tufted back allows for better relaxation. Ergonomic design makes it easy to use for those with back pain issues, the elderly, and people who’ve just undergone surgery. Silent motor, unlike most lift type recliners. Easy to use electric reclining element. Its high-quality fabric enhances durability. Lightweight yet high carrying capacity. Stylish and stain camouflaging color. Leg rest function can be complicated and requires some effort to operate after some time. The maximum lift height is somewhat short especially for 6” and above people. The COLIBROX Electric Lift Chair Recliner definitely stands competitively for its efficiency and durability. If you are looking for a fantastic, durable recliner for sleeping in, then the Colibrox Electric Lift Reclining Chair is a phenomenal choice for you. This is also our top choice if you are currently experiencing any sort of back pain or other issues that limit your mobility. The Esright Massage Recliner Chair is a well-constructed reclining chair with an inbuilt mechanism for massaging, heating, and vibrating for therapeutic purposes as well as general comfort. In addition, it provides a 360 Degree Swivel, and 150 degrees recline feature making it particularly perfect for lounges and of course sleeping. Esright is a trademark signed by Union Source Co. Ltd. The company started in 18th November 2005 mainly focusing on garments, shoes Kitchenware gifts, and promotion gifts. The Esright trademark was then signed in 2016 as they began to place their attention on designing furniture, sleeping bags, seats, sofas mattresses, and more household utilities. Two conveniently placed cup holders and four extra storage compartments for putting drinks and magazines. It comes with a remote-control device with five control modes and two intensity levels as well as an insulated and fused power cord – the chair heats, vibrates, and massages. Soft yet firm PU leather construction applicable for extended durability. Armrests, leg rest, and back padded with extra thick sponges for enhanced comfort and relaxation. Therapeutic massage, heating, and vibrating features particularly for lumbar support. Flexible recline of up to 150 degrees and a 360-degree swivel. Product dimensions of 33.1 x 35.8 x 43.2 (L x W x H), armrest thickness of 3.54” and a weight capacity of 92.61lbs. Adjustable armrest, back and leg rest. Slightly elevated headrest for better neck and head support – phenomenal for sleeping. The proportionate and spacious dimensions allow for comfort yet easily fit in most spaces in the house. Durable enough for everyday use. Small and lightweight enhance portability and applicable in small rooms or spaces. Has verified therapeutic effects on the body including improved blood circulation. Easy maintenance with as little or no cleaning needed. Impressive design and curves making it more appealing as well as decorative. It also comes in a choice of two other colors brown and cream. Additional rocking capabilities for better sleep. You cannot use one mechanism independently, i.e., you cannot heat the chair without the massage being on. The cup holders are rather small only fitting slim bottles and cans. The Esright Massage Recliner Chair is most suitable for a quick stress and fatigue reliever after a day’s work as well as for people with back pain or general joint pain issues. With all the fantastic features that the chair offers, we highly recommend considering utilizing this chair for sleeping and relaxing in. We are also huge fans of the remote control, power cord, and two intensity modes – this makes it an absolute pleasure to use the heating, massaging, and vibrating aspects of this recliner. If you’ve been long-awaiting that relaxing feeling that only massage chairs can offer, then this is your best selection. 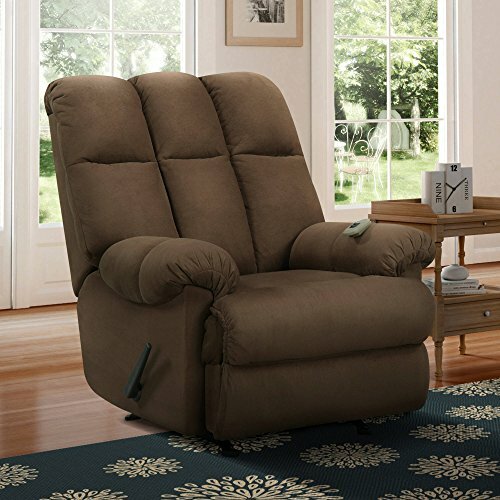 The Phoenix Mocha Cuddler Recliner is an oversized, heavily stuffed chair with plush seats and arms providing excellent comfort for whole family’s enjoyment. Simmons Upholstery is a trademark owned by United Furniture Industries (UFI). Starting in 2000, the UFI grew from merging and acquiring Comfort Furniture, Parkhill Furniture, and United Chair industries. Over the years, they have created an extensive line of microfibers, bonded leather, and upholstery furniture. The Phoenix Mocha Cuddler Recliner is made of superb quality, eco-friendly, durable, and waterproof polyutherane material that is closely similar to leather which additionally makes it’s conspicuously attractive. Heavily padded arms and back and thick, high-density foam cushions for extra comfort and relaxation while maintaining a healthy posture. Beauty-rest pocketed coils provide splendid support with limited bouncing from the sinuous wire springs. Overall dimensions of 50 x 42 x 30” and a weight capacity of 105 pounds. Made with a full steel mechanism and Steel rocker for a better sturdiness, stability, and weight support. Latch activated cuddler with great quality stitches covered in a soft light cover that complements interior décor. Nice comfort and boosted relaxation from heavy padding and cushioned seats – easy to sleep in. The detachable back allows for easier portability. Comes pre-assembled hence little or no further assembly needed. Flexible wire springs offer better weight distribution and prevent straining the chair frame and therefore enhancing durability. The recliner can open enough to allow an almost flat position which is suitable for sleeping. The polyutherane material is easy to clean and maintain due to its somewhat rough texture that prevents slipping and sliding. Stylish design attributed to the new gen, vibrant design of the neatly cut cushions and armrests, and attractive coloring that blends well with décor. The polyutherane material may become sticky in warm temperatures. Requires a little strength to open or close the recliner. Can be hard to retract the footrest. 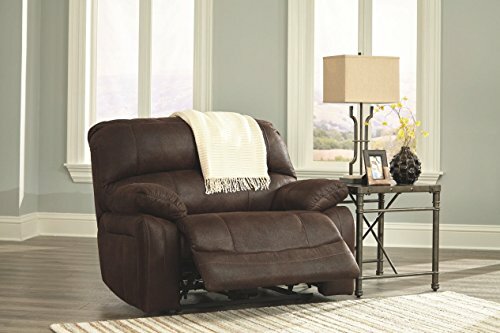 The Phoenix Mocha Recliner is a superb selection if you want a superior quality recliner that mimics the make and effect of full leather material without the extra price. 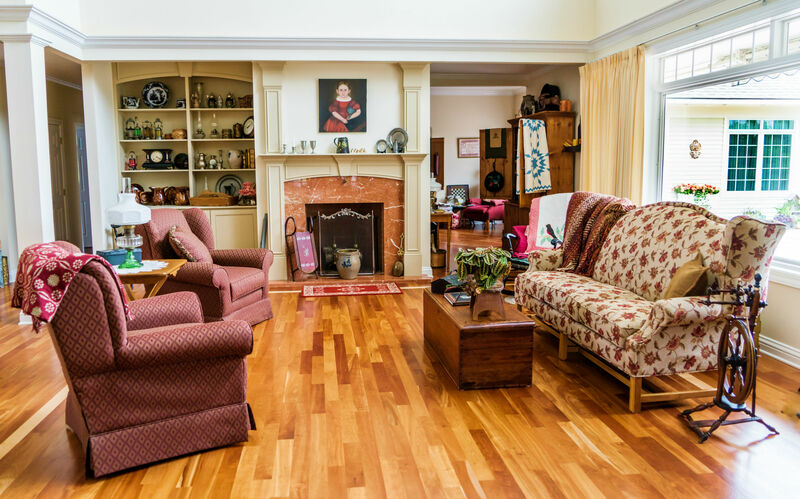 It is built using an accurate and long-lasting structure that will outlive most of the furniture in your home. Nevertheless, the full recline feature makes it suitable for sleeping without worrying about neck and back problems the following day. 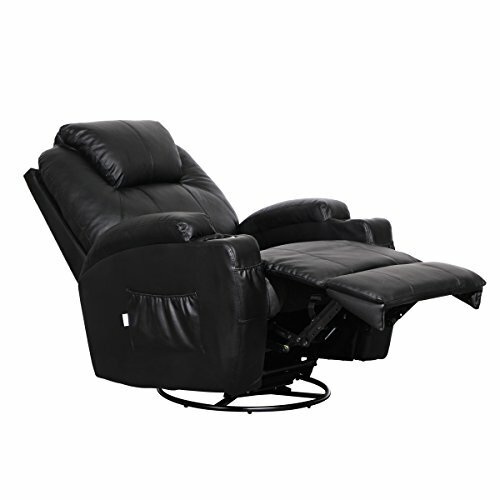 The eCom Rocket Padded Massage Rocker is a recliner designed specifically for absolute comfort. It has a unique design of dual zones on the massaging mechanism that works efficiently whether used simultaneously or individually. This is a fantastic choice if you are looking for a comfortable recliner chair for sleeping that also has high-end massaging features. Overstuffed arms and rocking motion for peak relaxation and comfort. Completely upholstered chair padding for leg and knee support. Stitched-in seat and back cushions made of foam for added comfort and strength. Rare dual massaging feature with high and low settings for highly efficient muscle therapy. Frame and leg made of steel material for enhanced durability. Seats constructed with coil springs to improve weight support. Product dimensions of 41 x 36 x 40” (L x W x H) and weight of 77 pounds. Accommodates a weight capacity of up to 225 pounds. Upholstery material made of Microsuede. Traditional manual lever release for effective recline. Comes with an Expert Home Arrangement Guide exclusive to the eCom Rocket Massage Rocker. Two-switch remote control device for controlling the massage functions. Highly comfortable due to the dense padding and seat filling. Therapeutic and efficient massaging effects. The material has an appealing color and design that boosts overall house décor. Convenient sizing that fits through most entrances. Slightly noisy when using the massaging utility. The suede material can be difficult to maintain since it takes time to dry when wet. The eCom Rocket Padded Massage Rocker Recliner is no doubt an excellent choice for a recliner that is comfortable to sleep in, especially with the numerous extra features it provides. Moreover, the beautiful color will be a nice addition to the interior design of your house. We highly recommend this recliner if you do not like the aesthetics of a traditional leather recliner, or if you are also looking for a massaging element. In as much as the fundamental aim is to sleep, modern recliners provide additional benefits. To enjoy a massage while you relax, choose recliners with built-in heating pads and vibrators. For the elderly and ill, recliners designed to assist in lifting the person upon waking up are better. These are usually easy to assemble, and the automatic system is straightforward. Finally, recliners for sleeping with silent back and forth rocking capabilities come in handy on a lazy day. All these individual functions meet the demand for improved sleeping patterns, increased lumbar support, opening up of airways to allow for better breathing and lesser snoring among other benefits. An ergonomic design that includes the fullness of seats, thickness of cushions, lower back support, allowance for stretching, and tilting capabilities make the recliners more comfortable. On the other hand, long-lasting eco-friendly materials, coated steel frames that resist rust, and soft genuine leather that is easy to clean (removable and washable) ensure durability. Whether natural (leather, cotton, linen etc.) or synthetic (microfiber, faux leather, chenille etc.) the type of material used determines how comfortable and durable the recliner will be. The best recliners for sleeping must blend well with the rest of your home. If you have a rustic theme, then chose a recliner with a rustic appearance. The last thing you need is a sleeping area that looks alienated form the rest of your home. A recliner with a footrest gives your legs optimum comfort. However, one with a smooth kickback function would be ideal to allow you to transition smoothly from sleeping to sitting. Armrests on the hand offer additional support on your upper body whereas the headrest positions your head and neck ergonomically to prevent spinal cord injuries as you sleep. The more the features provided in the best recliners for sleeping, the better for you. But if you’ll be sharing your recliners with other family members, for example, look for one whose features are adjustable. While choosing the best recliners for sleeping, consider the price alongside the individual features. A higher price tag does not always translate to higher quality. Most of the times, the country of origin determines the cost of the recliners. The US is known for making the best quality at a premium price whereas India and China produce lower quality recliners which may be at an equally cheaper rate to disguise its quality. This is a unique feature where the recliner feels weightless. They distribute the weight evenly thereby relieving stress. This feeling consequently enhances total relaxation during sleep. Recliners can broadly be classified as either manual or automatic. The former has a handle and lever while the latter has an electric motor, a switch, and a chord. Recliners achieve their position by lowering the backrest and raising the footrest. This motion can be triggered by pulling a lever or at the touch of a button. It solely depends on the type of recliner you are using. Recliners date back to early 1850’s. Reportedly, Napoleon III was the first to own a recliner chair. It was used as a chair, a bed, and chaise lounge. Many of the recliners made then were mainly for health purposes. American cousins Edward Knabush and Edwin Shoemaker patented the copyrights of a homely reclining bench (The La-Z-Boy) which came to form the face of traditional recliners. Initial models had no footrest until after 1920. Recliners have since transformed from simple designs to more complex ones. 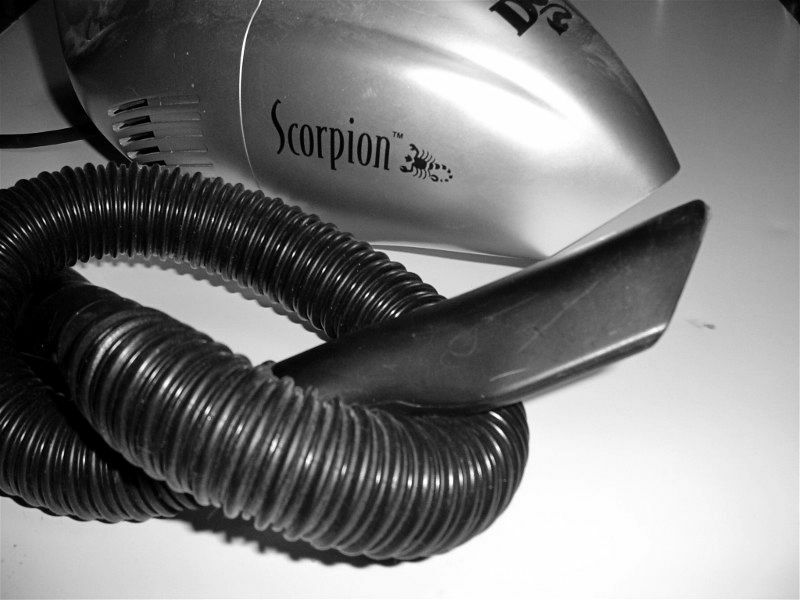 Additional features such as levers, vibrators, and heat pads have been incorporated to make them more reposeful. Rocker Recliners. They are not so different from a rocking chair only that they can recline as well. They are popular with nursing mothers. Wall Hugger Recliners (wall savers).These recliners are designed to fit in smaller rooms by reducing the space needed between the back of the chair and the wall. Swivel Recliners. As the name suggests, these recliners can turn 360˚ without requiring you to stand up. Lift Recliners. Apart from reclining, this chair can also help you to stand up. 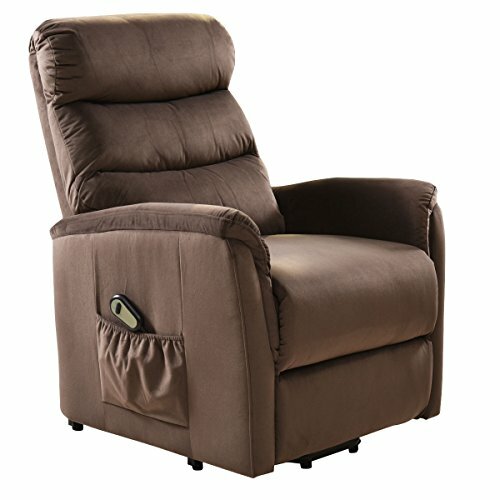 This recliner is common among the elderly and people with health complications. Heat and Massage Recliners. These are recliners which have additional features such as foot massage, heat dissipation, and vibration which is very soothing and relaxing. High Leg Recliners. They look like normal chairs except that they have reclining capabilities. They are suitable for small and large spaces alike. Regular Recliners. This type comes with a simple lever which you pull to achieve a reclined position. They are the most basic type of recliners. Love Seat Recliners. As the name suggests, these are designed to fit more than one person. The majority are automatic thus button controlled. Reclining helps your body to relax, and some (like the massage type) can help relieve back pain. The pressure that builds up during the day on your spinal cord can be reduced if you sleep while reclining. Helps iwith Breathing. Sleeping in a recliner opens up the diaphragm making breathing easier especially for people with Sleep Apnea. Calming the Nerves. Lifting the feet improves blood circulation consequently healing the nervous system. Comfort. Recliners are padded which makes them comfortable especially for people suffering from leg problems and backache. Therapeutic effect. Heat and massage recliners are embedded with a Cyclo-Therapy technology. This improves blood circulation and ‘heals’ the body. Excessive use of recliners can cause knee and hip contractures (tightening of the muscles over the joint). This consequently, reduces upright posture and standing. Balancing is also affected which puts you at an increased risk of a fall. Finally, leaving a recliner in an upright seated position during long hours of sleep proliferates spinal pressure. This is not the case when sleeping on a traditional mattress. 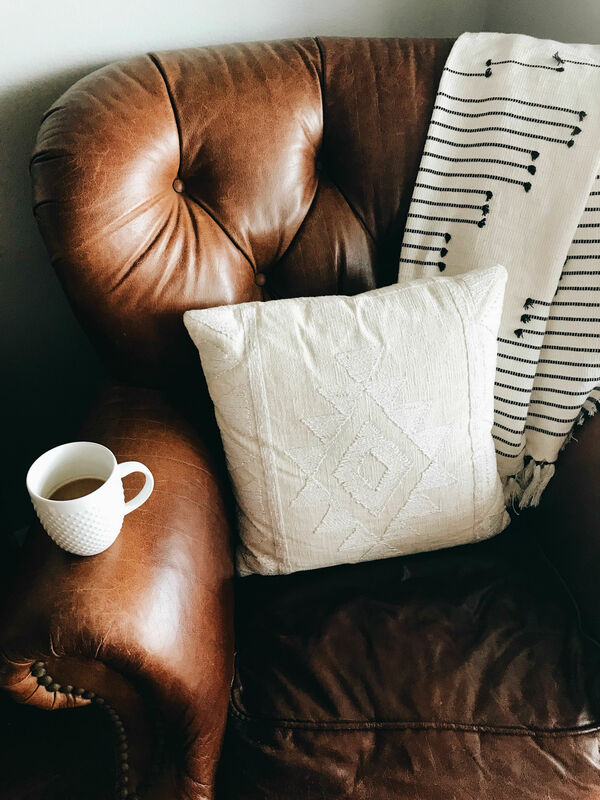 It is paramount to identify the type of fabric from which the recliner is made and consequently the suitable cleaning code (manufacturers usually indicate the appropriate cleaning standards). It is much easier if your recliner has a slipcover. Simply remove it, clean it separately, and let it dry. Additionally, you can utilize a vacuum cleaner on the recliner or just dust it. Remove any cushions then brush thoroughly to remove any loose dirt. Dip a cloth in mild detergent, ring it, and wipe off any stains on the upholstery. Alternatively, you can spray a solvent-based cleaner on the upholstery and let it stay for some time. Using a dry towel remove excess moisture from the recliner and leave it to dry. Clean the cushions separately with a soft-bristle brush to avoid any damage to the fabric. Always apply leather protectant after cleaning your recliner. Don’t always wait for liquid or food spills to stick on your recliners. Wipe them off immediately. If your recliner uses electricity, it is safer to plug it directly into the socket rather than using an extension lead. And if it has a backup battery installed, charge it regularly to keep it ready for operation during power blackouts. Place the recliner in a part of the room that does not experience extreme temperature fluctuations (as with all other electronics). Do not lean further on the chair when it is in a fully reclined position. It is also not advisable to sit on the footrest. Besides causing damage to the functioning of the chair, you might injure yourself. Do not leave the chair in a reclined position when not in use. And finally, have a professional check the recliner for any flaws or malfunctions on a regular basis. So there you have it! 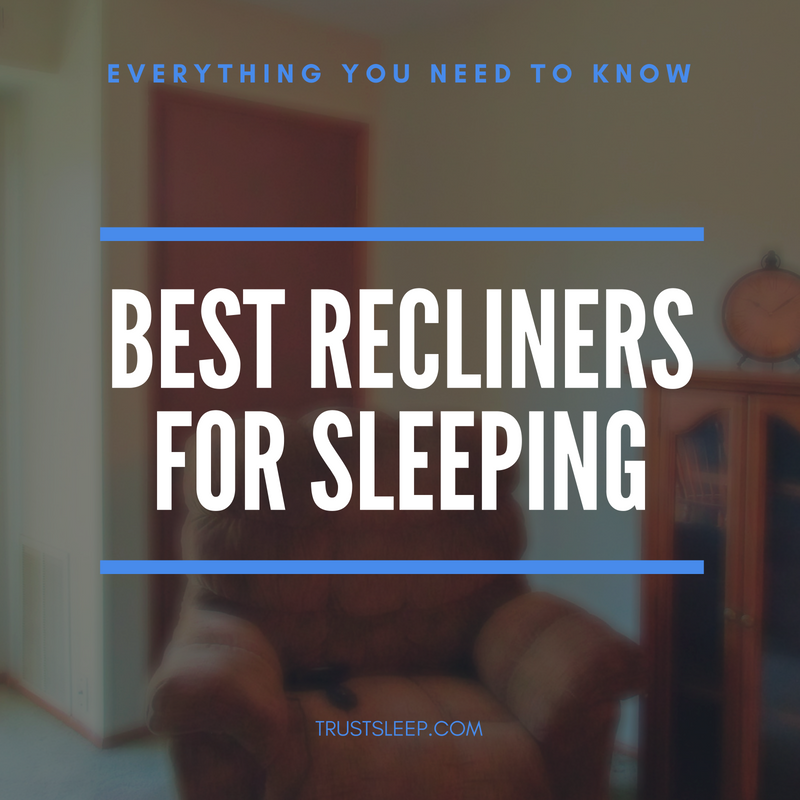 The best recliners for sleeping on the market today, along with everything else you need to know about cleaning your recliner, and what to look for. If you have any experiences with sleeping in a recliner chair, feel free to leave a comment or questions below. We wish you the best of luck with your new recliner!